Work continues in Magnolia's paper studio this week on a series of handmade paper works by Alexandre Arrechea. The artist has devised a unique composition strategy for creating his trademark mask shapes, comprised of photographic imagery of the corners of Cuban buildings, using handmade paper created at Magnolia Editions' paper studio. 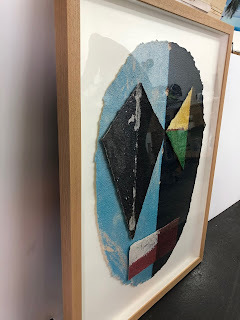 Handmade paper is formed in large custom shapes which are printed using UV acrylic ink and then 'floated' together within a frame to create a composite, collaged image with an unusual degree of dimensionality. The results of Arrechea's experiments with Magnolia, as well as a survey of the artist's mask works, will be exhibited at Galeria Nara Roesler in New York City (opening February 20, 2019) and at New York City's Armory Show at Piers 92 & 94 in March. Also check out the artist's colorful Instagram account for previews! How does one buy art from Magnolia? There is no information about this anywhere, nor are any prices shown for art on your website. Or do you not sell any of the work shown online?